92298X HP LaserJet 4 Toner (HP 98X) - Compatible with HP LaserJet 4, 4M, 4 Plus, 4M Plus, 5, 5M, 5N, 5SE, HP 98X (92298X) Remanufactured. 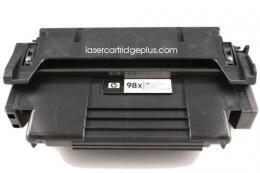 8,800 Yield, High Capacity Black Toner Cartridge. The HP compatible LaserJet 92298X Black Cartridge is ideal for the high-volume business user who is looking for a lower cost per page. The HP LaserJet 92298X Print Cartridge delivers convenience and 8,800 pages between changes, reducing orders, empties and the frequency of cartridge changes.